The water trail is a beautiful, easy float trip. This river trail begins at the refuge canoe launch and travels across the refuge through wooded canyons. It takes approximately two to four hours to float from the refuge launch to the next downstream landing. The trail is located on refuge lands that are additionally designated as a National Scenic River and National Wilderness Area. The Niobrara River, which was called Running Water by Indians and early settlers, extends across northern Nebraska from its narrow beginning in eastern Wyoming. It empties into the Missouri River some 300 miles east between the village of Niobrara and Niobrara State Park. Its springs and waterfalls make this river one of the nation's best canoeing waters. 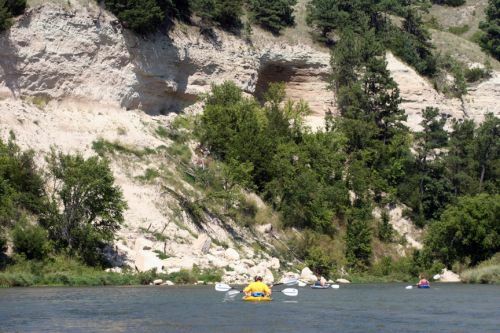 The Niobrara River is a relatively safe river to float and can be navigated by most novices. A 76-mile stretch of the Niobrara, including the section through the Ft. Niobrara National Wildlife Refuge (NWR), was designated a National Scenic River in 1991. The 5.6 miles of the Refuge portion of the river is considered the most "scenic" and offers visitors a unique experience not available elsewhere. The designated National Recreation Trail begins at the Fort Niobrara NWR Canoe Launch at Wild and Scenic River mile 4.8, and continues 5.6 river miles to the refuge's eastern boundary at river mile 10.4. The NRT section of river includes the first three sections of the Niobrara Wildlife and Scenic River Guide 2: Fort Niobrara To Berry Bridge. This includes: Fort Niobrara NWR Canoe Launch, Cornell Bridge to Fort Falls Rapids, and the Fort Niobrara Wilderness area. The NRT ends at the eastern boundary of the refuge. The fourth section of River Guide 2, Fort Niobrara Wilderness Area to Berry Bridge, flows through private property. The canoe launch is located adjacent to Cornel Bridge, on the upstream side. An ADA compliant launch is reserved for special needs, on the downstream side of the bridge. Allow 2-4 hours for a float trip through the Refuge. There is a $1 per person launch fee. Private outfitters in the area rent watercraft and provide shuttle services.